Seems like I'm doing a lot of head shots these days. (A lot being defined as more than any other type of job, aside from stock, which amounts to 3 in the past month or so - LOL!) Anyone wanting to get into acting, modeling, or theatrics of any sort needs a headshot. These are just head and shoulder portraits, typically in B&W, with very little touch-ups. Pretty straight forward with very little room for creativity. Of course I just can't keep my hands off a picture! And so I play with them anywayz - though the client also gets an untouched version to send off to perspective employers/schools. 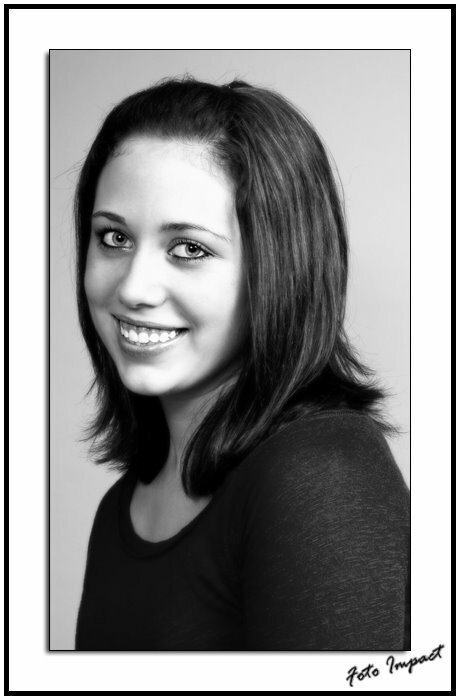 This young lady needed a headshot for the dance school that she hopes to attend in the near future. (This, of course, is my altered version. :) I also did my niece for the modeling school that she's attending and Janice (the trapeze artist from Seabreeze) for perspective employers. Heather wants one as soon as she gets her hair back to normal! LOL... Well, you know that quite sometime ago she dyed her hair Red with that "temporary" die and it never came out. Then she did it black and that never came out either and then she wanted it back to normal so she bleached her hair and made a MESS of that job. So her hair has some red, some black, some brown (the roots) and some white underneath!!! You can read it on her blog and even see a picture. I can't believe she didn't fix it sooner but people have told her that they like it! LOL. And so she's put off spending the $100 or so to get it fixed properly. Brianna G. Hmmm... Not ringing a bell. PS. She works with Josiah and has a couple of brothers who want to be musicians. Yes, but I never got close to the "G" family, thus an aquaintence with Brianna was never made.